While it has been some time since computer technologies were first introduced to social surveys, their methodological advantages, as well as potential limitations, are not yet fully appreciated by the relevant communities of scholars, mass media and governmental organizations. What can computer-assisted surveys do which ordinary paper and pencil interviews (PAPI) can never do? How does the usage of computer technology affect the quality of survey process and of collected data? More generally, what are the issues pertinent to the methodology of public opinion inquiry that are now revealed by the availability of computer-assisted surveying technique? The book seeks to address these questions systematically, with each individual chapter providing a well-focused analysis and ample evidence from Japan. As the computer-assisted survey is bound to be more dominant in the coming years, this book provides an important foundation for future academic studies as well as their practical applications in the field. Masaru Kohno received his PhD in Political Science from Stanford University in 1994. He had previously taught at the University of British Columbia and had been a National Fellow at Hoover Institution, before he joined Waseda University in Tokyo where he is currently a professor in the Department of Political Science and Economics. Professor Kohno also serves as a Senior Program Officer of the Social Science Section at Japan Society for the Promotion of Science. Yoshitaka Nishizawa received his PhD in Political Science from Yale University in 1989. He first taught at Meijigakuin University in Tokyo and he moved to Doshisha University in Kyoto in 1997. 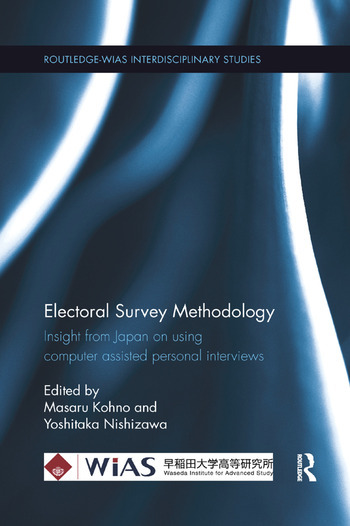 Professor Nishizawa is a member of the American Political Science Association, the Japanese Political Science Association, and the Japanese Association of Electoral Studies (JAES). He served as President for the JAES for the 2010–12 term.